Why Be Curious? Here’s a Nebbiolo blend etched by an extinct volcanic terroir of yellow porphyritic sand. 300 million years ago, a volcano created the raw material for the Coste della Sesia DOC and eight other geographically complex appellations, collectively known as Alto Piemonte. The addition of the varieties Croatina and Vespolina add resonance and spice to the wonder that is Nebbiolo, while the volcanic soils and more northerly latitude give wines of a particular elegance, perfume, and refreshment compared with the more powerful Nebbioli from Barolo and Barbaresco to the south. Vigna / Vineyard: In the commune of Roasio, in the Alto Piemonte DOC of Coste della Sesia. Soils are high-acid, yellow porphyritic sand of volcanic origin, which lends mineral character and perfumve to the wines. Natural farming, with only copper, sulfur, and natural fertilizer being added. Cantina / Cellar: Fermentation in stainless steel tanks with native yeasts; aging in used barriques. No filtering, fining, or other additions. Il Vino / The Wine: An Alto Piemontese Nebbiolo blend of elegance, minerality, and great drinkability. A Tavola… / At the Table… Drink it with protein-based antipasti and first courses or with lighter meat courses. 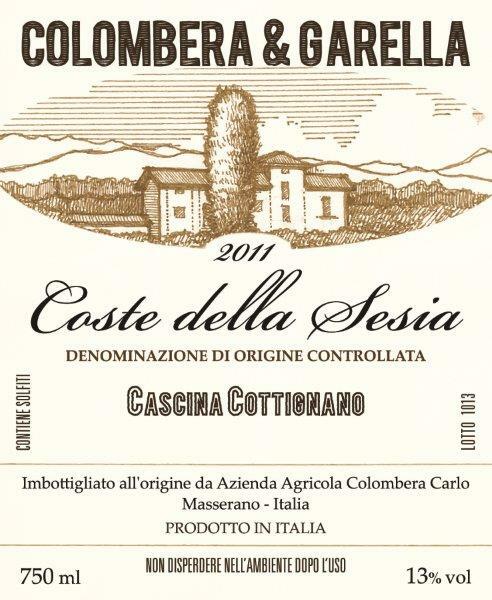 Denominazione / Appellation: Coste della Sesia. Nome / Name: Corticella (Roasio). Suoli / Type of soils: High-acid, yellow porphyritic sand of volcanic origin. Vitigni / Varieties: 70% Nebbiolo, 15% Croatina, 15% Vespolina. Densità / Planting Density: 3500 vines/hectare. Resa / Yield: 6000 kilograms / hectare. Fermentazione alcolica / Alcoholic fermentation: 14 days in stainless steel tanks, without temperature control. Affinamento / Élevage: 10-12 months in second and third passage barriques. Zolfo / Sulphur: 61 mg/L total, 25 mg/L free. Produzione annua / Annual production: 4500 bottles.